George Brett batting in 1990. 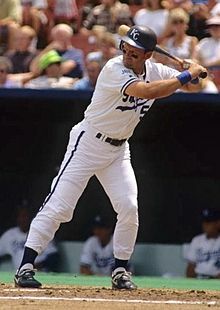 George Howard Brett (born May 15, 1953 in Glen Dale, West Virginia) is a retired American baseball player. He played 21 years in Major League Baseball (MLB) for the Kansas City Royals. He is a member of the Baseball Hall of Fame and was inducted in 1999 with a fourth-highest voting percentage in baseball history (98.2%). Brett was a third baseman and designated hitter. Brett won the World Series with the Kansas City Royals in 1985. In 1994, his number (#5) was retired by the Royals. He is one of only two Royals players to have his number retired by the team (the other is Frank White). Brett was also notorious for putting excessive amounts of pine tar on his bats, which sometimes led to confrontations and interventions with the umpires, as there is a league rule governing the use of pine tar on the bat. He raises money for the disease ALS (amyotrophic lateral sclerosis) or better known as Lou Gehrig's Disease. ↑ "Royals Retired Numbers". Kansas City Royals.